The funeral service for Gerald “Bud” Hill, 83, a longtime Stewartville,MN area resident will be at 11:00 A.M. on Friday (July 13, 2018) at Immanuel Lutheran Church in Pleasant Valley Twsp,MN with Rev. Colin Duling officiating. The burial and committal service will take place at Woodlawn Cemetery in Stewartville. Mr. Hill died on Thursday (July 5, 2018) surrounded by his family, from congestive heart failure, at Mayo Clinic – Rochester, St. Marys Campus, where he had been a patient for two weeks. Gerald Norman Hill was born on August 17, 1934 in Fillmore County, MN to Clark and Florence(Jensen) Hill. He moved with his family as a young boy and grew up in rural Stewartville,MN where he attended Stewartville H.S. He farmed with his family in rural Stewartville and then began driving truck hauling livestock in the area and started his own business - Hill Trucking. Gerald was married on April 8, 1956 at St. Johns Lutheran Church in Stewartville to Joan A. Schatz. The couple lived in Stewartville when Bud was drafted into the U.S. Army serving from 1957 to 1959. They returned to Stewartville and Bud served 4 more years with the MN. National Guard. In 1962, the Hills moved to High Forest Twsp. , where they raised their family and lived for over 30 years. Bud was employed at Fullerton Lumber in Rochester as a driver for a number of years. He was then employed at LaCrescent Ready Mix in Stewartville as plant manager and continued as manager with Ready Mix Concrete until his retirement in 1992. Joan was a homemaker and also was employed as kitchen manager at the YMCA in Rochester for 10 years, until her retirement. Bud and Joan moved into Stewartville in 1996, where they have continued to make their home. 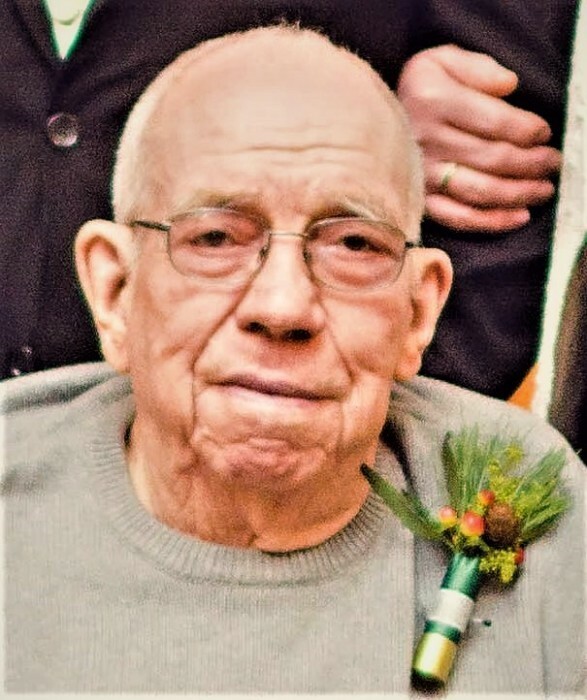 Bud was a past member of the Stewartville United Methodist Church and for the last 60 plus years was a member of St. Johns Lutheran Church in Stewartville and then at Immanuel Lutheran Church serving with it’s Mens Club and on other committies. He was a longtime member of the Stewartville American Legion, the Center for Active Adults in Stewartville and a past member of the Teamsters. Bud was an avid wood worker selling many of his creations at area craft sales. He enjoyed playing baseball as a teenager and followed the Twins and other sports and enjoyed fishing. Bud liked to visit with friends and spend time with family, especially his grandchildren and great grand-children. Joan and family would like to thank the staff at St. Marys Hospital for their loving care of Bud these past weeks and the Stewartville First Responders for their recent help. Bud is survived by his wife – Joan and his daughter and son – Mark( Barbara) of High Forest,MN and Karen(George) VonRuden of Claremont,MN; 4 grandchildren – Matthew(Melisa) Hill, Pamela(Justin) Brown, Zachary(April) VonRuden, Tyler VonRuden(Taylor Helgeson); 6 great grandchildren – Landon and Jeron, Alison, Jameson, Eli and Aurora; sister - Marilyn Hague of St. Peter,MN and nieces and nephews. He was preceded in death by his infant son – Curtis Wayne, his parents, sister – Odessa and husband Roland Hare and brother-in-law – Lynn Hague. A time of visitation for family and friends will take place from 5 to 7:00 P.M. on Thursday (July 12, 2018) at Griffin-Gray F.H. in Stewartville and 1 hr. prior to the service at the church on Friday morning.